In 2016, armed militants took over the Malheur National Wildlife refuge in Harne y County, Oregon. For forty-one days, they seized the headquarters of the refuge and for three months, they occupied the community led by Ammon Bundy and Ryan Bundy. This month, Oregon State Press published Peter Walker’s Sagebrush Collaboration, the first book-length study of this militant take over. 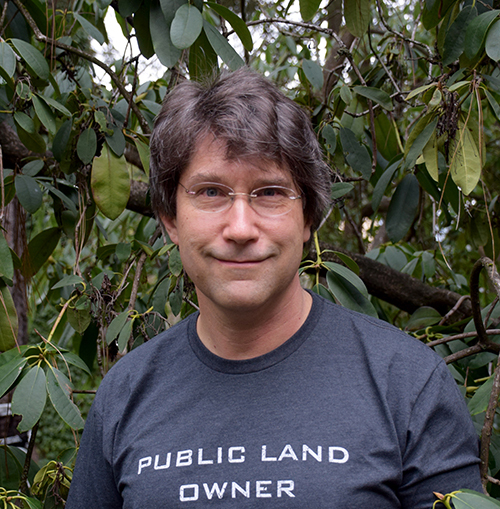 In Sagebrush Collaboration, Peter Walker contextualizes and researches the take over as well as considers the future of America’s public lands. Today on the blog, Walker provides an update about the Bundy's anti-federal revival tour, political ambitions and Harney County efforts to rebuild community. Books have a beginning and an end, but the story that I attempted to tell in Sagebrush Collaboration began well before the events of January 2016, and continue to the present day. In reality, there were two stories. The one I felt most important to tell—the one that virtually all media reports at the time ignored—was about Harney County’s success in building collaboratives that, in the words of one prominent local rancher, “inoculated us from the Bundy disease.” That story can be dated to the late 1990s and the early 2000s, when local ranchers, federal managers, the Burns Paiute tribe, environmentalists and others decided to try cooperative approaches to solving long-standing problems. That effort paid off handsomely when the Bundy family arrived. The Bundys offered solutions based on armed confrontation with federal authorities; but the community had their own solutions—ones built on principles of collaboration. The collaborative approach won, and quietly continues today. I continue to follow it. The other story—the one that got almost all the headlines, then and now, was about the radical vision and strategy offered by the Bundy family. As it happens, my book ended at almost precisely the time when the Bundy movement shifted to a new phase. I turned in the first draft of Sagebrush Collaboration on December 18, 2017. 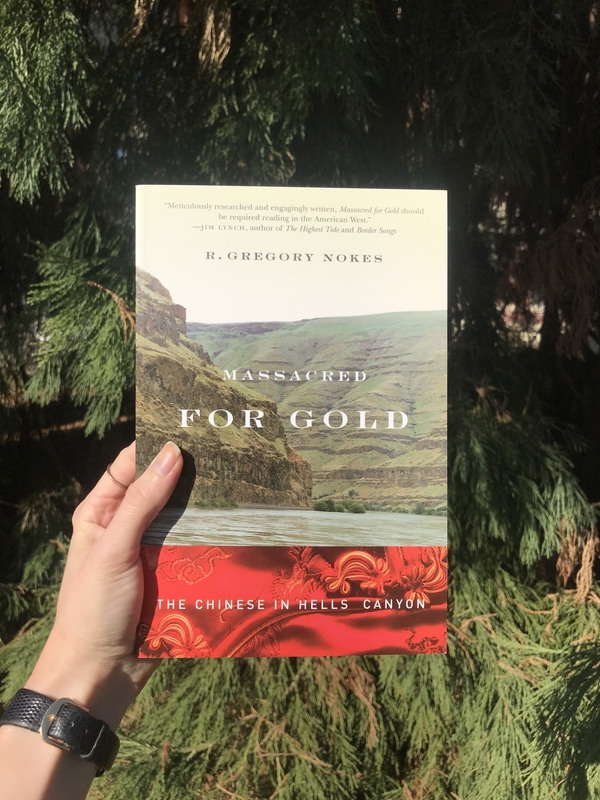 With the generous permission of my editors at Oregon State University Press, before the book went to print I was able to update a few key events that occurred in early 2018. The most significant of these was the dismissal, on January 8, 2018, of all charges against the main figures in the 2014 armed Bunkerville standoff, due to mishandling of evidence by federal prosecutors. Immediately, the newly-freed members of the Bundy family publicly declared that their fight was only just beginning. That declaration sent shivers down the spines of those of us who witnessed the trauma of the occupation of Harney County in 2016. What, exactly, would the Bundy family, now elevated to the status of near-mythic Goliath-slaying western heroes, do? The obvious concern was that the Bundys would initiate new armed confrontations. After all, the takeover of the Malheur National Wildlife Refuge in 2016 was a direct follow-on from the 2014 standoff at the Bundy Ranch in Nevada in 2014. The Bundys were clearly looking for a way to leverage their success in facing down federal authorities at Bunkerville into a broader anti-federal government movement. Although they failed in 2016 to transfer the Malheur Refuge to local control or ignite a wider anti-government movement, the Bundys gained extraordinary fame and public attention. Those of us who met the Bundys and understood the depth and passion of their anti-federal government ideology had no doubt that, once freed, they would attempt to leverage their greatly enhanced fame into further anti-federal government actions. To date those actions have not included further armed confrontations—though many of us who have followed the Bundy story closely continue to believe that such confrontations are almost certainly only a matter of time. Instead, for the moment the Bundy family appears to be investing their energy in building a wider base of public support for anti-federal actions. Whatever one thinks of the Bundys’ political ideology, there is no disputing their industriousness and talent for promoting their cause. On January 20, 2018, less than two weeks after all federal charges against the Bundys were dismissed, patriarch Cliven Bundy (wearing a “Not Guilty!” lapel button) and his son Ryan Bundy spoke to a large crowd in Paradise, Montana. Cliven challenged Montanans to “act like you understand the Constitution.” That is Bundy-speak for resisting federal authority. Notably, this first major public speaking event for the Bundy family after the dismissal of charges against them was organized with support from Montana State Senator Jennifer Fielder, the CEO of the American Lands Council—a group that promotes the transfer of federal public lands and is supported by billionaire anti-federal activist brothers Charles and David Koch. The Montana event was the first of many in which the Bundy family, with support from the wealthy and powerful, would spread their anti-federal gospel. On their 2018 anti-federal revival tour, the Bundys’ message took on a darker and more overtly religious tone. On April 22, I attended an event in Modesto, California, sponsored by oil tycoon Forrest Lucas’ organization Protect the Harvest, at which Ammon Bundy accused the federal government of being controlled by environmentalists whom Bundy described as “enemies of humans” and of God. Bundy specifically and repeatedly called out by name one specific environmentalist leader, who he accused of worshipping “Baal,” a false god in Bundy’s view. Calling out a specific environmental leader as an enemy of humans and God appeared to invite violence against that individual—after all, one knows what to do with enemies of God. The concern is real, given that in 2014 two Bundy supporters at the Bunkerville standoff gunned down two police officers in Las Vegas, pinning a note on one of the bodies declaring the murder “the beginning of the revolution.” If not intentional invitations to violence, the Bundys say nothing to discourage such ideas among their more unstable supporters. Hints of violence have been present in almost all of the speaking events by Cliven, Ammon, and Ryan Bundy in 2018, consistent with the unofficial but explicit Bundy family motto, to do “whatever it takes” to achieve their anti-federal political goals. On May 26, 2018, I attended a speech by Ammon Bundy in Yreka, California—home to the anti-government State of Jefferson movement—in which Bundy encouraged supporters to “stand” in defense of their water rights not in the courts but “there at the diversion.” It was an echo of the events of the early 2000s when angry farmers whose irrigation water had been shut off used chainsaws and blowtorches to seize water in the Klamath River that had been reserved for endangered salmon and local tribes. When a local organizer introduced Ammon Bundy to the Yreka audience, she recounted a conversation with Bundy by phone in which he agreed to come only if anti-government locals were “ready to stand”—meaning ready for civil disobedience. In the Bundy worldview, civil disobedience is all but synonymous with armed civil disobedience. What is most powerful in each of the Bundys’ public performances has been their remarkable and clearly intentional successes in tapping into and stirring up strong emotions. There is no shortage of anti-federal government sentiment in the rural American West. The Bundy family, however, have become masters of transforming long-simmering grudges into a near-frenzied emotional state. At almost every speaking event in 2018, Ammon Bundy, for example, took out various military medals, flags, and uniforms given to him by ex-military supporters during the Malheur Refuge takeover. As Bundy takes out each item, he tells the tale of how veterans bestowed the gifts on him—which he declares that he did “not deserve.” In every instance, tears well up in Ammon Bundy’s eyes and his voice chokes up as he tells the stories. Invariably, tears flow down the cheeks of audience members as well. Tapping into the most potent symbols of traditional American patriotism, Bundy invokes the ideals of armed, patriotic heroism and transfers those ideals onto himself and his cause. And at every opportunity the Bundys invoke the blood sacrifice of slain Bundy supporter LaVoy Finicum—declaring Finicum a martyr for “freedom.” The call for further sacrifice in the cause of freedom is all but explicit. While navigating toward the same goal of a federal-free, “sovereign” American West, Ammon Bundy’s brother Ryan has taken a different path—making himself an official candidate for the office of Governor of Nevada. It might seem a surprising choice; but not really. During the Malheur Refuge takeover in 2016, I heard Ryan Bundy specifically say that eliminating federal control in the western states cannot be achieved through conventional electoral politics because a single elected official will stand alone and will not be able to get the changes they want. Ryan Bundy is very smart, and it seems unlikely that he actually believes he is going to become governor. Like the Malheur takeover and the Bunkerville standoff, however, Ryan Bundy’s campaign for governor gives him a megaphone to speak to the public. More importantly, I fear that when Ryan Bundy inevitably loses his bid for governor, it will enable him and his family and supporters to say they tried to achieve their goals through conventional political channels. They will almost certainly claim the political system is rigged against them. That would “prove” to their supporters that further radical and potentially violent anti-government actions are necessary—that is, doing "whatever it takes." Meanwhile, back in Harney County, the pioneers and innovators of non-violent, collaborative problem-solving approaches continue the unglamorous work of re-building community trust and relationships that can enable them to weather possible similar political disruptions in the future. Scholars, including myself, are seeking to understand how Harney County succeeded, and how the positive lessons from Harney County might be applied elsewhere. The ever-industrious Bundy family will no doubt refine their approaches as well. Which of these two stories prevails may literally decide the future of the rural American West. Peter Walker studies the social factors that shape human interactions with the environment, with emphasis on the rural American West, and Africa. 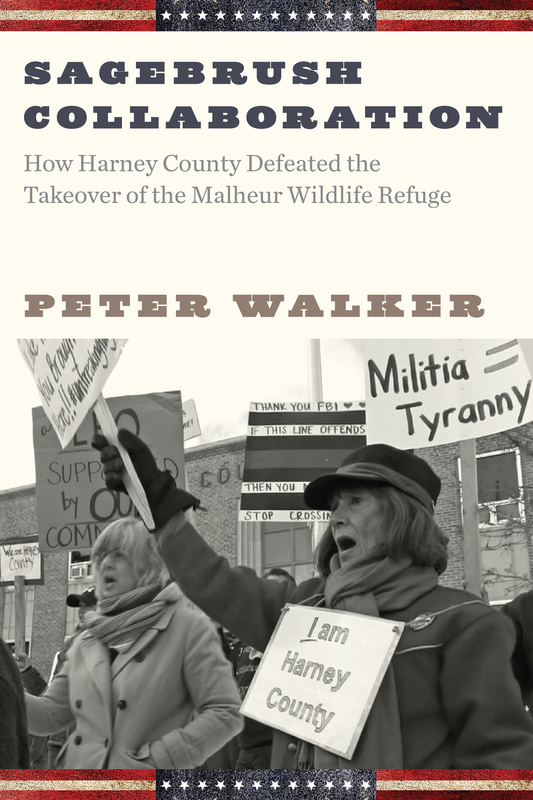 After the takeover of the Malheur National Wildlife Refuge in early 2016, Walker became almost a part-time resident of Harney County while writing this book. A native Westerner, Walker received his doctorate at UC Berkeley and has served on the faculty of the University of Oregon since 1997. Hello! Carolyn and Zoë here, writing to you from the OSU Press office! As yearlong Griffis Publishing Interns, we contribute blogs weekly but before we take that blog wheel and drive, we’d like share a bit about ourselves and share what OSU Press books that interest us. Zoë I’m in my second and final year at OSU’s MFA program and currently writing my thesis, which is a collection of short stories. In terms of reading, I enjoy strange and surreal stories, and hybrid forms. I also enjoy reading cultural criticism, literary criticism, and academic texts that focus on race, feminisms, disability and illness, gender and sexuality, and trauma. I’ve lived in Los Angeles, Santa Cruz, and Oakland, and am new to the Pacific Northwest. During my internship, I’m interested in learning how a small academic press functions, specifically in terms of marketing and editing. 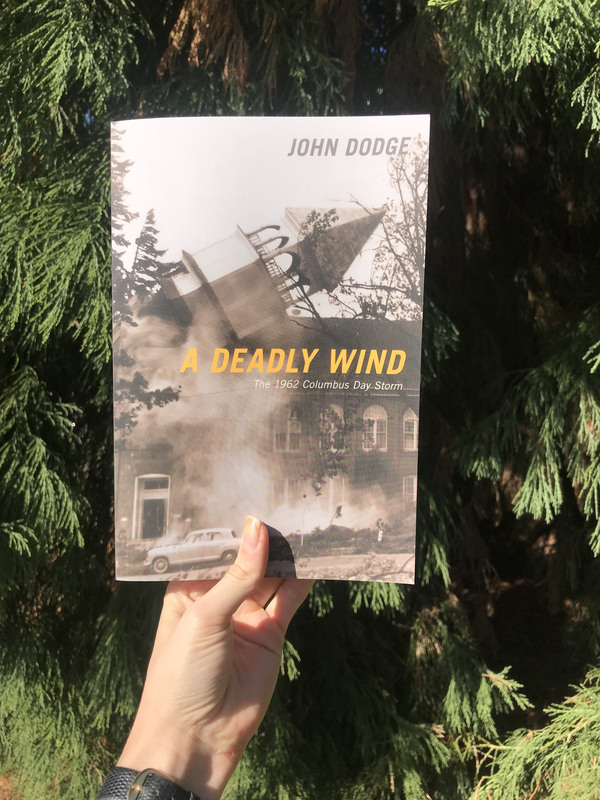 On my to-be-read pile are two OSU Press titles: R. Gregory Nokes’s Massacred for Gold and John Dodge’s A Deadly Wind. 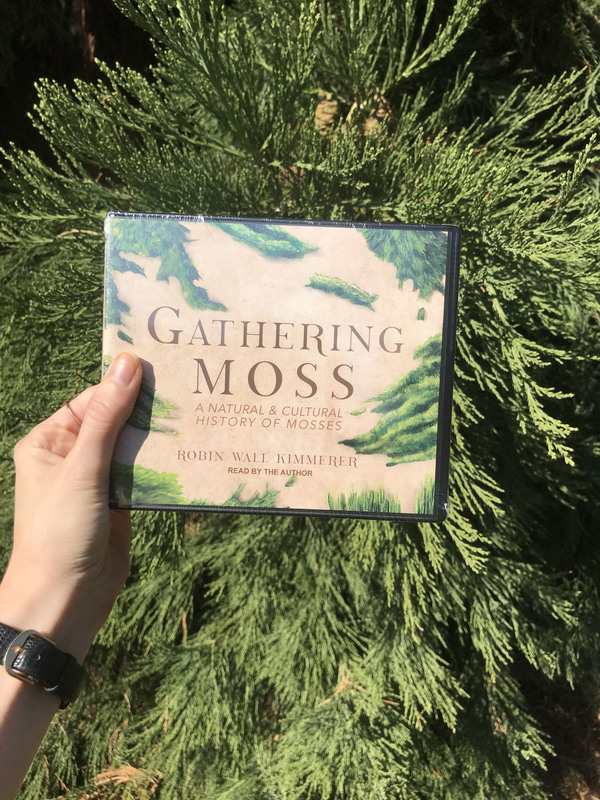 I’m currently listening to the audiobook of Robin Wall Kimmerer’s Gathering Moss. Gathering Moss by Robin Wall Kimmerer: Ever since I’ve moved to Oregon, I’ve fallen in love with moss; I love that way it glows bright green during endless grey days. While I’m curious and want to know more about moss, I wanted to find a book that was accessible and entertaining for the non-scientific reader and now I’ve found it in the form of an audiobook. The Gathering Moss audiobook is a collection of linked personal essays read by Kimmerer and perfect for a long drive. My name is Carolyn Supinka. I’m in my second year of my MFA at Oregon State University where I am studying poetry. I’m interested in poetry as a way of asking questions of myself, of relationships, of memory, and of the world. As a visual artist, I create screen prints and ink drawings that blend my writing and visual work. I am learning letterpress printing, and I am really interested in experimenting with book arts, starting with broadsizes and zines. As an OSU Press intern, I’m looking forward to learning more about the world of publishing. I think it could be a bridge between my background in arts management and my interest in working with a writing community. 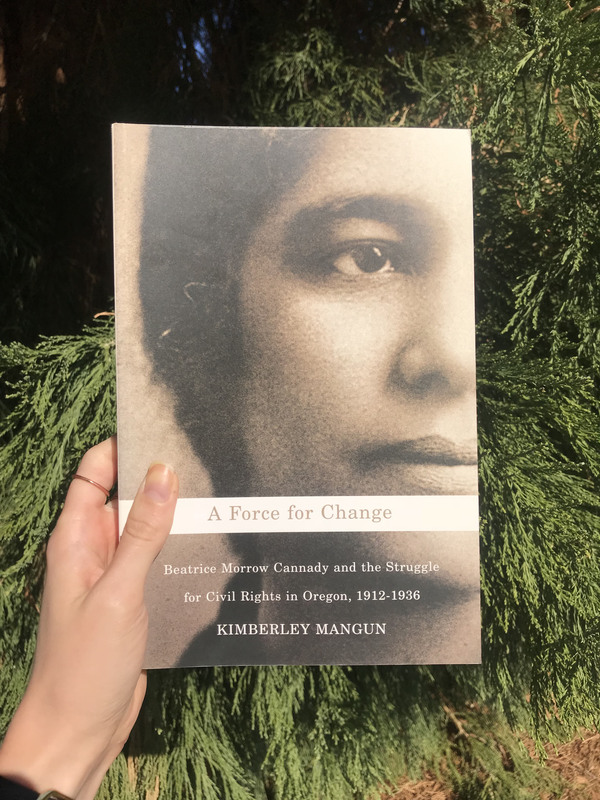 I really want to learn more about Oregon history, so I’m excited to start learning about journalist and activist Beatrice Morrow Cannady. This is the first full-length study of the life and work of Cannady, who was a civil rights activist as well as a editor and publisher of Oregon’s largest African American newspaper. Cannady did so much work to advocate and protect her community, and to work towards better race relations in Oregon. Growing up on the east coast, I was in love with the forests that I explored throughout my life, and my love of being out in nature only grew when I moved to Oregon. I appreciated the areas of wilderness that I visited, but did not know very much about the history of the government organization connected to them. 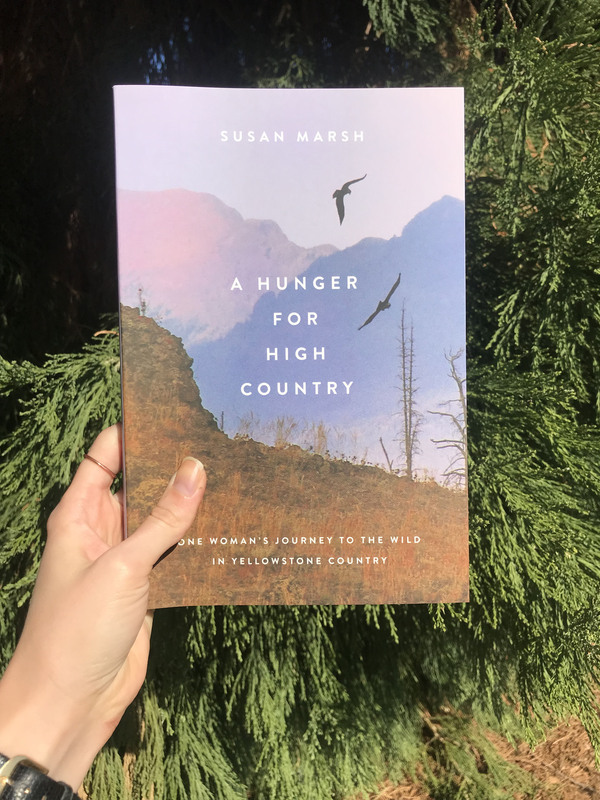 Susan Marsh’s story of working in the male-dominated US Forest Service during the 1960s and 70s is a fascinating profile of the Service, the relationship between people and the land, and struggles women face in patriarchal institutions. What does ‘home’ mean? Who can call a place home? 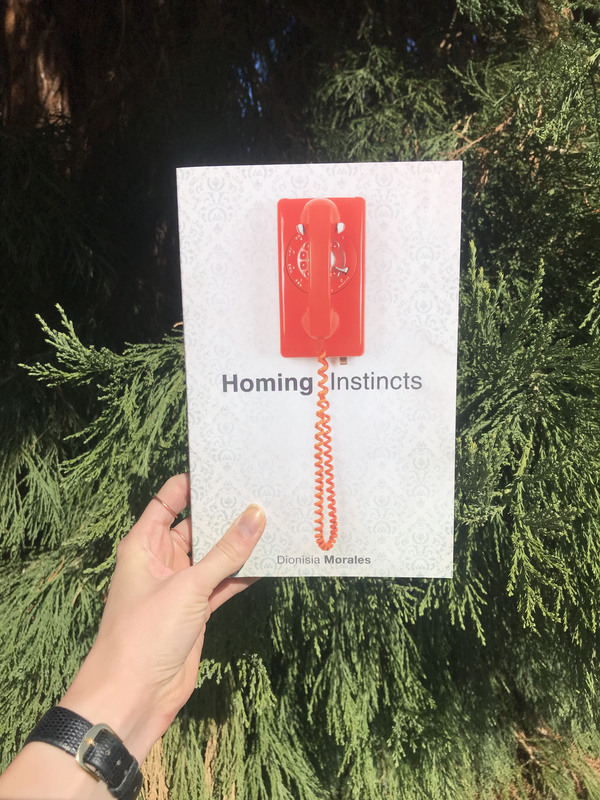 Dionisia Morales explores the connections between identity and ideas of home in this beautiful collection of essays. I explore ideas of place, identity, and memory in my work, so I’m very excited to dive into Dionisia Morales’ writing, especially since she is an OSU MFA program alumnus. Indigenous People’s Day is a day to honor native communities: a day to honor indigenous history, survival, and culture, and to acknowledge the history of the United States as one formed through colonization and genocide. In honor of Indigenous People’s Day, OSU Press Griffis publishing interns Zoë Ruiz and Carolyn Supinka share two recent press books on indigenous culture. How do Indigenous communities and individuals sustain and create geographies within the boundaries of the settler colonial nation of the United States? How does this occur through place-naming, daily cultural practice, and artistic activism? Published less than a year ago, Barnd’s Native Space explores these questions through an interdisciplinary approach, draws on his experiences in Corvallis, and focuses on Midwestern Plain states of Kansas and Oklahoma. 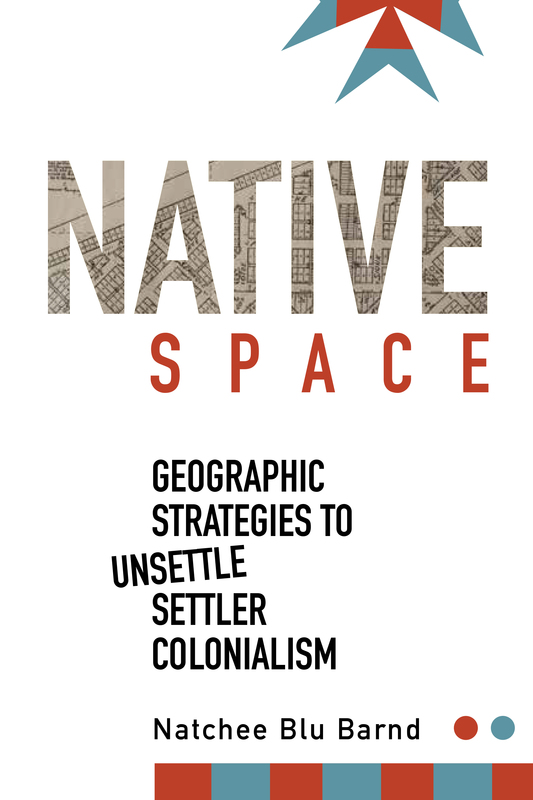 In Native Space, Barnd argues that while “the Indian” and “Indianness” serve to create White space in concrete ways, Native geographies reclaim Indigenous identities, assert relations to the land, and refuse settler colonialism claims. I highly recommend Native Space to readers interested in comparative ethnic studies, indigenous studies, cultural studies, and cultural and critical geography. I love legends, so I was interested in Legends of the Northern Paiute as soon as I saw it on the shelves here at the OSU Press offices. This book shares origin stories like the creation of the human people, why the rat’s tail has no fur, how the stars got their twinkle, and why Coyote howls at the sky. The stories are written in the conversational style in which they are traditionally told in Paiute communities during the winter storytelling season in the Great Basin. Wilson Wewa first encountered these legends as a child when they were told to him by his grandmother, Maggie Wewa, and other tribal elders. 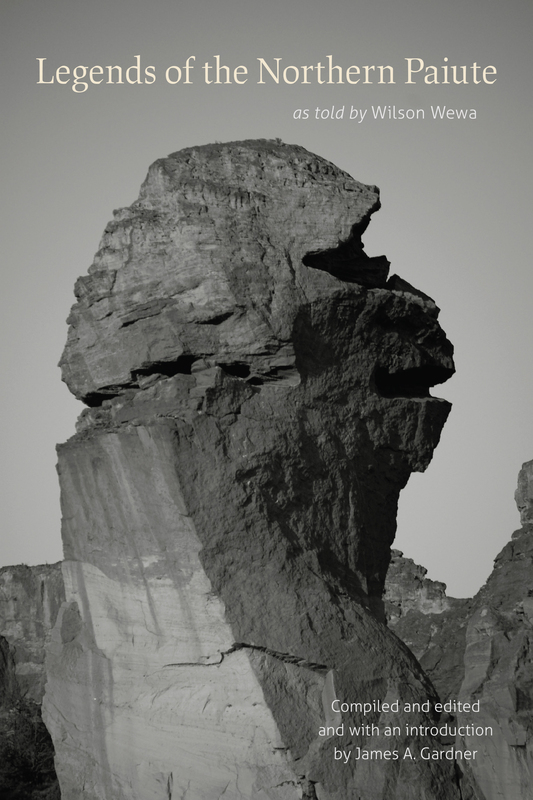 In this book, Wewa, a spiritual leader and oral historian of the Warm Springs Paiute, shares twenty-one previously unpublished legends. Wewa, along with collaborator James Gardner, recorded these stories from in-person recollections and edited them out loud so as to remind readers how these stories were originally told: out loud and in community with others. From mapmaking practices in Kanaka Hawai‘i Cartography to the uses of myrtlewood in Ethnobotony of the Coos, Lower Umpqua, and Siuslaw Indians, OSU Press publishes books that promote education and scholarship on indigenous culture. Take a look at our website for a full list of OSU Press books on indigenous studies. We hope you pick up one of these titles to celebrate and study indigenous culture any day of the year. This summer my friend Laura Glazer and I had the chan ce to visit with Neale and Trish Langman who have made their home at the Hazel Hall house in Portland. I had long been curious to see where Hazel Hall had lived and written and was so pleased that Neale and Trish were open to a visit. Our visit was prompted by a sabbatical project I am currently working on with Laura and several other collaborators. The project, entitled The Room Upstairs: Uncovering the Life and Poetry of Hazel Hall, will result in new, original music composed for dance and will premiere during Collaborations 2019* at Lane Community College in March 2019. The music and dance unfold in three movements titled after Hall's three books of poetry: Curtains, Walkers, and Cry of Time. I scored the piece for cello, violin, and piano and mapped it to the larger themes of each volume of poetry. Curtai ns includes an entire section of poems devoted to the subject of sewing and needlework and to the physical attributes of her interior space. The music unfolds slowly and introspectively. I specifically chose cello to be the featured voice of this movement because its melancholy timbre recalls the elegiac feeling of Hall’s poetry and the bowing motion suggests the motion of sewing. Walkers is largely addressed to the various people whom Hall viewed from her second story window as they walked by her house. Here the music picks up tempo and becomes more interactive, with themes being traded between instruments that also shift roles as the music unfolds. And Cry of Time, published posthumously, speaks to transcendental themes, with poems that touch on Hall's reckoning with her own mortality, the limits of her art, and the solidarity she felt with other women. The music for this movement begins in anguish but progressively moves to resolution. The initial theme from Curtains returns but in a transformed state. After its presentation, it gradually ascends in a dance-like interplay that brings the work to its final close. Many years earlier, I became intensely interested in the poet Hazel Hall when I came across a poem of hers, Maker of Songs, in Cracking the Earth, the 25th Anniversary edition from Calyx, published in 2001. The poem attracted me immediately because of its use of musical metaphor. A short bit in the back told me a little about her--that she was "confined to a wheelchair for most of her life" and that she “spent her days doing needlework, viewing the physical world through a window and a small mirror propped on her windowsill, and writing poetry that transcended her circumstance.” As I was curious to learn more, I reached out to John Witte who had edited The Collected Poems of Hazel Hall and included his own fine introduction about her life and work. John and I talked about Hazel Hall over a nice meal together, which furthered my interest and curiosity. 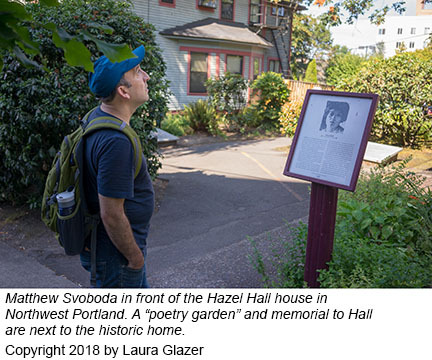 I began to research whatever I could find about Hazel Hall at the University of Oregon library and later paid a visit to her former home in Portland, but only to the outside. This was all many years ago, before life got busy with a new child, a new job, and the responsibilities of home ownership. Seeing Hazel Hall’s former home first hand several years later was an illuminating experience. As might be expected, the house has changed since she lived in it up until her death in 1924. It is now divided into two separate residences, with Neale and Trish living in the part where Hazel had spent most of her days. There has also been some remodeling and updating to the entrance and kitchen, and carpet now covers the floor in the main room that faces the street. Yet, even so, artifacts and features of the house remain from her time--light fixtures, the lattice window, a room upstairs. 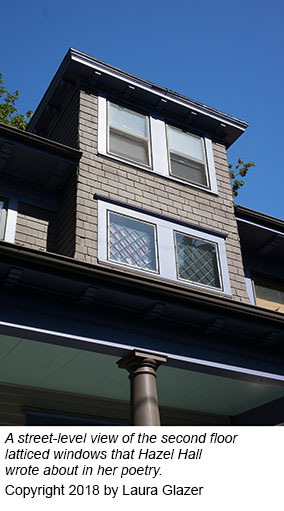 Standing in the main room and looking through the lattice window, I could get a clearer sense of how Hazel might have done her needlework or gazed around her house or to the street below to find inspiration for her poems. The four of us conversed on many topics while visiting together and seeing their home. 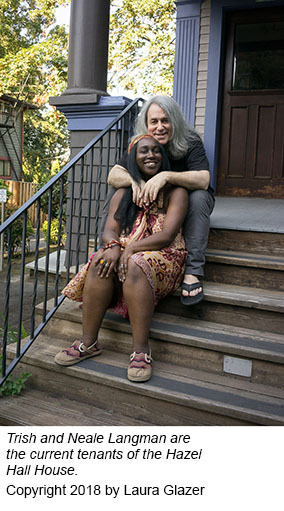 I came to learn that Neale and Trish, both artists, had moved into Hazel's home from New York City a decade earlier, sight unseen. Only later did they learn about Hazel Hall and her interest and background in sewing as a means to a livelihood. This was particularly intriguing because Trish, a textile artist, has made her studio in the room upstairs, which Hazel references in her poetry as a place she couldn’t visit. 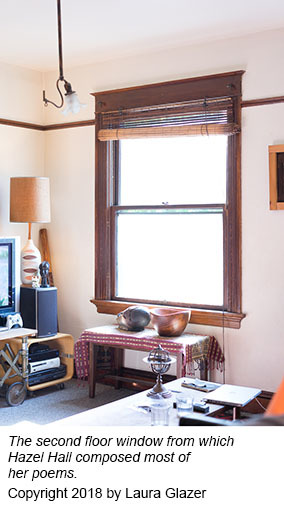 This room upstairs in turn became the inspiration for the title of our collaboration—a tribute to a remarkable poet who was also unseen as she gazed out at the world from her window. For more information on The Room Upstairs: Uncovering the Life and Poetry of Hazel Hall, visit the project website: www.hazelhall.net. An evening devoted to celebrating the life and work of poet Hazel Hall through research, original music, and a new work for dance. Collaborations 2019 is March 7-9 and highlights the original work of dance faculty, guest artists, and dance groups in our community in collaboration with musicians, videographers, and designers. Produced annually in Ragozzino Hall on the main campus of Lane Community College, Collaborations celebrates the many voices of dance in our community. More information will be available in late 2018 via the Hazel Hall project newsletter; sign up for it here.